Kate made waves when she appeared in a military/navy inspired Alexander McQueen outfit to visit areas affected by riots. First, many thought the military look to be too severe given that the occasion involved visiting those personally affected by the riots, including people who had lost loved ones. Second, many were up in arms that Kate would choose to wear such an expensive outfit ($995 skirt paired with the matching $1355 blouse) to such a poverty stricken area. But of course here we put the politics aside and are only talking light-hearted fashion. 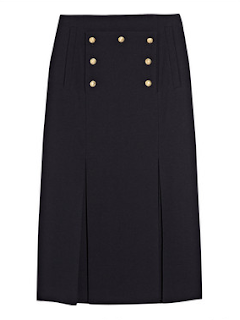 The wool crepe skirt features a placket detail, reminiscent of sailor pants, trimmed in gold buttons. The original style also has thigh-high slits which were closed up a bit - but still thigh high - for Kate. Since the fit is narrow and straight, like a pencil skirt, the slits are almost necessary to be able to walk and move in the skirt. Retails for ≈ $995 U.S. but is as low as $477.60. Alexander McQueen wool crepe skirt. a dark or navy color. some sort of button placket detail. a straight, pencil-style fit with slit. This Ann Taylor skirt is a very close repli-Kate. It is a dark navy tweed with button placket, only in this version the button detail is more subtle. One idea to bling it out a bit and bring it closer to the original would be to simply swap out the dark buttons for gold ones, an easy DIY fix. The button placket is flanked by exposed zippers on either side of the panel. The description states it is an A-line skirt but from the picture you can clearly see that it is more of a straight style fit. This Ann Taylor skirt retails for ≈ $98 but is as low as $79.99. Ann Taylor - tweed zip A-line skirt. A less literal translation of the style would be this side button skirt from New York & Co. It is less costume-y than the original, this looks like a suit separate and is much more subdued, yet it still has the style of the original. NY & Co. - Side button skirt.